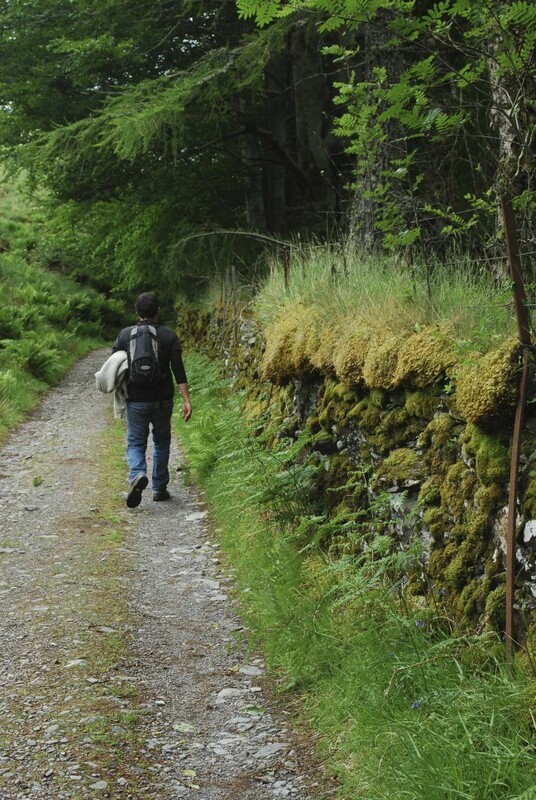 Going for a stroll, Knoydart style. Imagine a place where there’s no TV, no mobile phone reception, no roads in or out and no shops. And they’re proud of it. That’s Knoydart on the west coast of Scotland. So how do you get there? Well, you could hike for a couple of days. Or take a boat for 45 minutes (guess which one we did!). And what’s there when you get there? Well. If you love big resorts and waterparks and golf courses and mini golf courses, then I don’t think Knoydart is for you. But if you love a place that runs at a completely different pace, that is surrounded by mountains, the sea, old stone walls, forest, walking tracks, and the odd roaming deer, then Knoydart is a little slice of heaven. We stayed at the Knoydart Lodge, where it felt like our hosts were opening their home to us. That’s because essentially, they are. The rooms are enormous, with views out to the sea (if you look past all the sundry gardening stuff on the lawn) and the breakfasts are To Die For. The hardest thing you will have to do in Knoydart is decide what to have for breakfast. And at least someone should order the baked eggs. I don’t know how they tasted but they looked SPECTACULAR. Knoydart Lodge is a little bit out of the village – about a ten minute walk, in fact – but you’re never in a hurry to go anywhere, so it doesn’t matter. We hiked – well, we walked, who am I kidding? – about an hour over the back of Knoydart and were rewarded with views of mountains, glens and streams. Spying a cross up on a hill, we naturally decided to go and look at it – we’re intrepid like that. And that’s when I discovered that the delightful green meadows stretching over the hillsides are in fact tussocks that collapse under your feet, plunging your feet into boggy wet ground. Not recommended if you have a tiny bit of bone floating around in your left ankle (by the way, I have a tiny bit of bone floating around in my left ankle), but who am I to let that stand in the way of getting up close to an ancient stone cross on a hill. Turns out the stone cross wasn’t actually that old, but the view was worth the pain. Take my word for it, it was pretty. After all that ankle-busting hiking, obviously we deserved a hearty meal and some tasty beverages. Now, your dining options in Knoydart are not extensive. There is a little cafe that’s open a few days a week (not when we were there, naturally) or there’s the pub. The pub is awesome though. The Old Forge is the most remote pub in mainland Britain. How’s that for a title? And it is a jumping little hive of activity. There are lots of ruddy faced outdoorsy types who have hiked up mountains, and freshly showered sailing types who have anchored in the bay for the night, and the odd dog or two (if your dog bothers people who are eating their dinner, please kindly put it on a lead. I love this place!). And us. 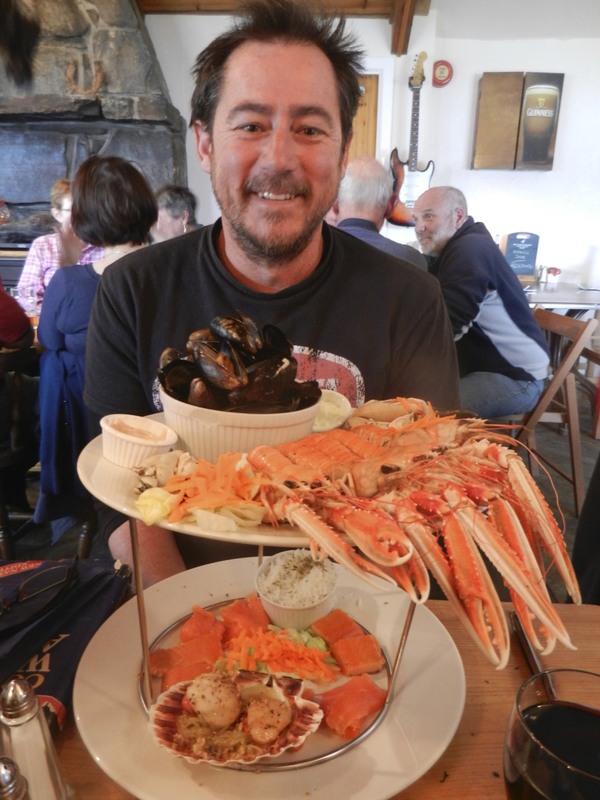 If you want to make a statement, order the seafood platter. It’s two storeys high and has so much seafood on it, that a walrus would be happy. And it’s all sourced within a 7 mile radius too. The langoustines were the size of VW beetles. I lost sight of Gav for about an hour as he worked his way through it. At the next table were a group of retirees who were having a sailing holiday, interspersed with teasing Australians about rugby. They were having a rip roaring time and when they left, the whole pub peered out the window to watch their tinny wobble towards their yacht. It appears that whisky inhibits your ability to climb from a small boat onto a yacht. Highly entertaining. The thing about Knoydart is that there’s not a whole lot to do there, and that’s what makes it magical. You’re forced to slow down, breathe deeply and wander aimlessly. Three of my favourite things to do.